March 1st 1966 saw a remarkable moment in Soviet space exploration history and a significant step forward for the Soviets in the space race. Venera 3 was the first man-made space probe designed and built to reach and explore Venus and despite crashing on the planet it became the first spacecraft to reach another planet. Containing electrical power sources, radio communications and other electronic devices the severity of the crash prevented any data from being taken but it managed to go one step closer than the Americans had four years earlier when one of their probes managed to measure Venus’ surface temperature at eight hundred degrees Farenheit! Despite the ‘failure’ it didn’t stop the Soviets and a year later Venera 4 successfully ejected temperature probes, gas analyser’s and density probes into Venus’ atmosphere. 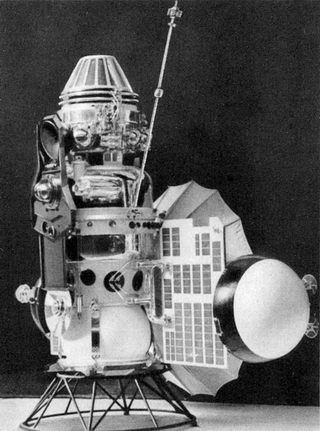 By 1970 they had designed and soft-landed Venera 7 which managed to record and send back almost thirty minutes of data before being destroyed by the incredible heat and atmospheric conditions. These events are worth remembering not just in the context of space exploration but in a wider historical sense. Today we see joint missions to space stations, shared data and ever closer scientific ties but during the Cold War the competition for space supremacy was second only to the arms race. Events such as these were lauded by both sides, astronauts were hailed as national heroes and all along vast sums of money were plunged into both space missions and weapons testing whilst innocent people on both sides lived in poverty and endured hardship so easily preventable had their leaders chosen another path. It is worth considering the human cost during the Cold War and what could have become of those innocent victims of countries who neglected them in favour of winning races with no moral reason behind them.